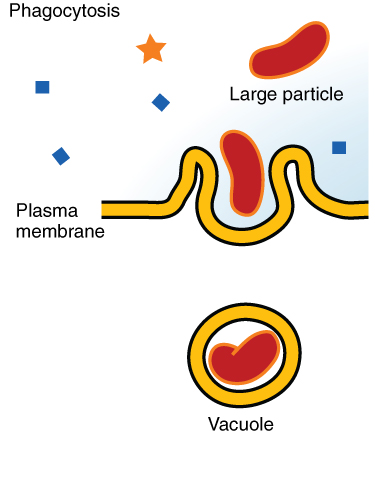 Phagocytosis (from Ancient Greek φαγεῖν(phagein), meaning 'to eat',andκύτος, (kytos), meaning 'cell') is the process by which a cell uses its plasma membrane to engulf a large particle (≥ 0.5 μm) , giving rise to an internal compartment called the phagosome. It is one type of endocytosis . In a multicellular organism's immune system, phagocytosis is a major mechanism used to remove pathogens and cell debris. The ingested material is then digested in the phagosome. Bacteria, dead tissue cells, and small mineral particles are all examples of objects that may be phagocytized. Some protozoa use phagocytosis as means to obtain nutrients. Protozoa is an informal term for single-celled eukaryotes, either free-living or parasitic, which feed on organic matter such as other microorganisms or organic tissues and debris. Historically, the protozoa were regarded as "one-celled animals", because they often possess animal-like behaviors, such as motility and predation, and lack a cell wall, as found in plants and many algae. Although the traditional practice of grouping protozoa with animals is no longer considered valid, the term continues to be used in a loose way to identify single-celled organisms that can move independently and feed by heterotrophy. Sir William Osler, 1st Baronet, was a Canadian physician and one of the four founding professors of Johns Hopkins Hospital. Osler created the first residency program for specialty training of physicians, and he was the first to bring medical students out of the lecture hall for bedside clinical training. He has frequently been described as the Father of Modern Medicine and one of the "greatest diagnosticians ever to wield a stethoscope". Osler was a person of many interests, who in addition to being a physician, was a bibliophile, historian, author, and renowned practical joker. One of his achievements was the founding of the History of Medicine Society of the Royal Society of Medicine, London. Ilya Ilyich Mechnikov was a Russian zoologist best known for his pioneering research in immunology. The innate immune system is one of the two main immunity strategies found in vertebrates. The innate immune system is an older evolutionary defense strategy, relatively speaking, and it is the dominant immune system response found in plants, fungi, insects, and primitive multicellular organisms. The adaptive immune system, also known as the acquired immune system or, more rarely, as the specific immune system, is a subsystem of the overall immune system that is composed of highly specialized, systemic cells and processes that eliminate pathogens or prevent their growth. The acquired immune system is one of the two main immunity strategies found in vertebrates. Acquired immunity creates immunological memory after an initial response to a specific pathogen, and leads to an enhanced response to subsequent encounters with that pathogen. This process of acquired immunity is the basis of vaccination. Like the innate system, the acquired system includes both humoral immunity components and cell-mediated immunity components. Collagenases are enzymes that break the peptide bonds in collagen. They assist in destroying extracellular structures in the pathogenesis of bacteria such as Clostridium. They are considered a virulence factor, facilitating the spread of gas gangrene. They normally target the connective tissue in muscle cells and other body organs. Serine proteases are enzymes that cleave peptide bonds in proteins, in which serine serves as the nucleophilic amino acid at the (enzyme's) active site. They are found ubiquitously in both eukaryotes and prokaryotes. Serine proteases fall into two broad categories based on their structure: chymotrypsin-like (trypsin-like) or subtilisin-like. In humans, they are responsible for coordinating various physiological functions, including digestion, immune response, blood coagulation and reproduction. Degradation can be oxygen-dependent or oxygen-independent. Some Bacteria, for example Treponema pallidum, Escheria coli or Staphylococcus aureus, are able to avoid phagocytosis by several mechanisms. In some, such as amoeba, phagocytosis takes place by surrounding the target object with pseudopods, as in animal phagocytes. In humans, the amoebozoan Entamoeba histolytica can phagocytose red blood cells. Ciliates also engage in phagocytosis. In ciliates there is a specialized groove or chamber in the cell where phagocytosis takes place, called the cytostome or mouth. Phagocytes are cells that protect the body by ingesting harmful foreign particles, bacteria, and dead or dying cells. Their name comes from the Greek phagein, "to eat" or "devour", and "-cyte", the suffix in biology denoting "cell", from the Greek kutos, "hollow vessel". They are essential for fighting infections and for subsequent immunity. Phagocytes are important throughout the animal kingdom and are highly developed within vertebrates. One litre of human blood contains about six billion phagocytes. They were discovered in 1882 by Ilya Ilyich Mechnikov while he was studying starfish larvae. Mechnikov was awarded the 1908 Nobel Prize in Physiology or Medicine for his discovery. Phagocytes occur in many species; some amoebae behave like macrophage phagocytes, which suggests that phagocytes appeared early in the evolution of life. Kupffer cells, also known as stellate macrophages and Kupffer–Browicz cells, are specialized macrophages located in the liver, lining the walls of the sinusoids. They form part of the mononuclear phagocyte system. An opsonin is any molecule that enhances phagocytosis by marking an antigen for an immune response or marking dead cells for recycling. Opson in ancient Greece referred to the delicious side-dish of any meal, versus the sitos, or the staple of the meal. Antibody opsonization is the process by which the pathogen is marked for ingestion and eliminated by the phagocytes. 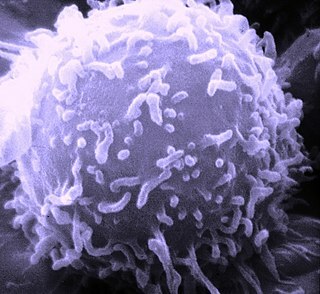 An Fc receptor is a protein found on the surface of certain cells – including, among others, B lymphocytes, follicular dendritic cells, natural killer cells, macrophages, neutrophils, eosinophils, basophils, human platelets, and mast cells – that contribute to the protective functions of the immune system. Its name is derived from its binding specificity for a part of an antibody known as the Fc region. Fc receptors bind to antibodies that are attached to infected cells or invading pathogens. Their activity stimulates phagocytic or cytotoxic cells to destroy microbes, or infected cells by antibody-mediated phagocytosis or antibody-dependent cell-mediated cytotoxicity. Some viruses such as flaviviruses use Fc receptors to help them infect cells, by a mechanism known as antibody-dependent enhancement of infection. An alveolar macrophage is a type of macrophage found in the pulmonary alveolus, near the pneumocytes, but separated from the wall. Collectins (collagen-containing C-type lectins) are a part of the innate immune system. They form a family of collagenous Ca2+-dependent defense lectins, which are found in animals. Collectins are soluble pattern recognition receptors (PRRs). Their function is to bind to oligosaccharide structure or lipids that are on the surface of microorganisms. Like other PRRs they bind pathogen-associated molecular patterns (PAMPs) and danger-associated molecular patterns (DAMPs) of oligosaccharide origin. Binding of collectins to microorganisms may trigger elimination of microorganisms by aggregation, complement activation, opsonization, activation of phagocytosis, or inhibition of microbial growth. Other functions of collectins are modulation of inflammatory, allergic responses, adaptive immune system and clearance of apoptotic cells. The mannose receptor is a C-type lectin primarily present on the surface of macrophages, immature dendritic cells and liver sinusoidal endothelial cells, but is also expressed on the surface of skin cells such as human dermal fibroblasts and keratinocytes. It is the first member of a family of endocytic receptors that includes Endo180 (CD280), M-type PLA2R, and DEC-205 (CD205). 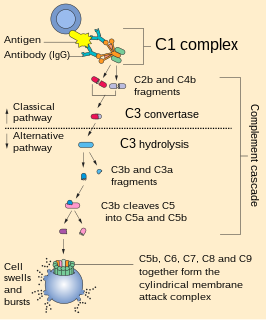 C3b is the larger of two elements formed by the cleavage of complement component 3, and is considered an important part of the innate immune system. C3b is potent in opsonization: tagging pathogens, immune complexes (antigen-antibody), and apoptotic cells for phagocytosis. Additionally, C3b plays a role in forming a C3 convertase when bound to Factor B, or a C5 convertase when bound to C4b and C2b or when an additional C3b molecule binds to the C3bBb complex. 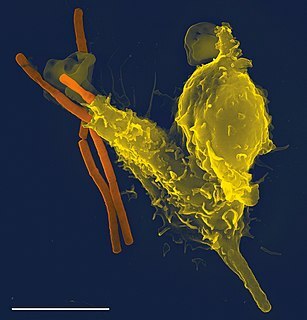 Macrophage-1 antigen is a complement receptor ("CR3") consisting of CD11b and CD18. A non-specific immune cell is an immune cell that responds to many antigens, not just one antigen. Non-specific immune cells function in the first line of defense against infection or injury. The innate immune system is always present at the site of infection and ready to fight the bacteria; it can also be referred to as the "natural" immune system. The cells of the innate immune system do not have specific responses and respond to each foreign invader using the same mechanism. Methicillin-resistant Staphylococcus aureus (MRSA). Apoptotic-cell associated molecular patterns (ACAMPs) are molecular markers present on cells which are going through apoptosis, i.e. programmed cell death. The term was used for the first time by C. D. Gregory in 2000. Recognition of these patterns by the pattern recognition receptors (PRRs) of phagocytes then leads to phagocytosis of the apoptotic cell. These patterns include eat-me signals on the apoptotic cells, loss of don’t-eat-me signals on viable cells and come-get-me signals ) secreted by the apoptotic cells in order to attract phagocytes. 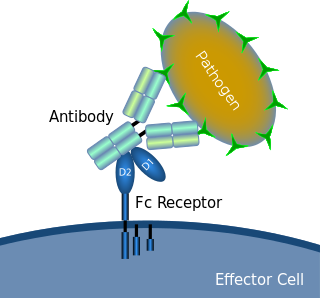 Thanks to these markers, apoptotic cells, unlike necrotic cells, do not trigger the unwanted immune response. Phagoptosis is a type of cell death caused by the cell being phagocytosed by another cell, and therefore this form of cell death is prevented by blocking phagocytosis. ↑ Ambrose, Charles T. (2006). "The Osler slide, a demonstration of phagocytosis from 1876: Reports of phagocytosis before Metchnikoff's 1880 paper". Cellular Immunology. 240 (1): 1–4. doi:10.1016/j.cellimm.2006.05.008. PMID 16876776. 1 2 3 4 Gordon, Siamon (March 2016). "Phagocytosis: An Immunobiologic Process". Immunity. 44 (3): 463–475. doi:10.1016/j.immuni.2016.02.026. 1 2 3 4 5 6 M.), Murphy, Kenneth (Kenneth (2012). 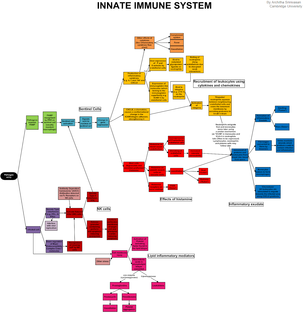 Janeway's immunobiology. Travers, Paul, 1956-, Walport, Mark., Janeway, Charles. (8th ed.). New York: Garland Science. ISBN 9780815342434. OCLC 733935898. 1 2 3 Witko-Sarsat, Véronique; Rieu, Philippe; Descamps-Latscha, Béatrice; Lesavre, Philippe; Halbwachs-Mecarelli, Lise (May 2000). 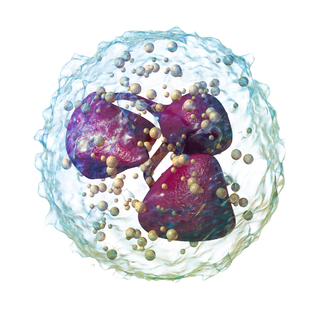 "Neutrophils: Molecules, Functions and Pathophysiological Aspects". Laboratory Investigation. 80 (5): 617–653. doi:10.1038/labinvest.3780067. ISSN 0023-6837. 1 2 3 4 5 Aderem, Alan; Underhill, David M. (April 1999). "MECHANISMS OF PHAGOCYTOSIS IN MACROPHAGES". Annual Review of Immunology. 17 (1): 593–623. doi:10.1146/annurev.immunol.17.1.593. ISSN 0732-0582. ↑ Flannagan, Ronald S.; Jaumouillé, Valentin; Grinstein, Sergio (2012-02-28). "The Cell Biology of Phagocytosis". Annual Review of Pathology: Mechanisms of Disease. 7 (1): 61–98. doi:10.1146/annurev-pathol-011811-132445. ISSN 1553-4006. ↑ Borowitz JL, Gunasekar PG, Isom GE (12 Sep 1997). "Hydrogen cyanide generation by mu-opiate receptor activation: possible neuromodulatory role of endogenous cyanide". Brain Research . 768 (1–2): 294–300. doi:10.1016/S0006-8993(97)00659-8. PMID 9369328. ↑ Stelmaszyńska, T (1985). 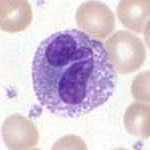 "Formation of HCN by human phagocytosing neutrophils--1. Chlorination of Staphylococcus epidermidis as a source of HCN". Int J Biochem. 17 (3): 373–9. doi:10.1016/0020-711x(85)90213-7. PMID 2989021. ↑ Zgliczyński, Jan Maciej; Stelmaszyńska, Teresa (1988). The Respiratory Burst and its Physiological Significance. pp. 315–347. doi:10.1007/978-1-4684-5496-3_15. ISBN 978-1-4684-5498-7. ↑ Bilyy RO, Shkandina T, Tomin A, Muñoz LE, Franz S, Antonyuk V, Kit YY, Zirngibl M, Fürnrohr BG, Janko C, Lauber K, Schiller M, Schett G, Stoika RS, Herrmann M (January 2012). "Macrophages discriminate glycosylation patterns of apoptotic cell-derived microparticles". The Journal of Biological Chemistry. 287 (1): 496–503. doi:10.1074/jbc.M111.273144. PMC 3249103 . PMID 22074924. ↑ Mukundan L, Odegaard JI, Morel CR, Heredia JE, Mwangi JW, Ricardo-Gonzalez RR, Goh YP, Eagle AR, Dunn SE, Awakuni JU, Nguyen KD, Steinman L, Michie SA, Chawla A (November 2009). "PPAR-delta senses and orchestrates clearance of apoptotic cells to promote tolerance". Nature Medicine. 15 (11): 1266–72. doi:10.1038/nm.2048. PMC 2783696 . PMID 19838202. ↑ Roszer, T; Menéndez-Gutiérrez, MP; Lefterova, MI; Alameda, D; Núñez, V; Lazar, MA; Fischer, T; Ricote, M (Jan 1, 2011). "Autoimmune kidney disease and impaired engulfment of apoptotic cells in mice with macrophage peroxisome proliferator-activated receptor gamma or retinoid X receptor alpha deficiency". Journal of Immunology. 186 (1): 621–31. doi:10.4049/jimmunol.1002230. PMC 4038038 . PMID 21135166. ↑ Kruse, K; Janko, C; Urbonaviciute, V; Mierke, CT; Winkler, TH; Voll, RE; Schett, G; Muñoz, LE; Herrmann, M (September 2010). "Inefficient clearance of dying cells in patients with SLE: anti-dsDNA autoantibodies, MFG-E8, HMGB-1 and other players". Apoptosis. 15 (9): 1098–113. doi:10.1007/s10495-010-0478-8. PMID 20198437. ↑ Han, CZ; Ravichandran, KS (Dec 23, 2011). "Metabolic connections during apoptotic cell engulfment". Cell. 147 (7): 1442–5. doi:10.1016/j.cell.2011.12.006. PMC 3254670 . PMID 22196723. ↑ Grønlien HK, Berg T, Løvlie AM (July 2002). "In the polymorphic ciliate Tetrahymena vorax, the non-selective phagocytosis seen in microstomes changes to a highly selective process in macrostomes". The Journal of Experimental Biology. 205 (Pt 14): 2089–97. PMID 12089212. ↑ Montagnes, Djs; Barbosa, Ab; Boenigk, J; Davidson, K; Jürgens, K; Macek, M; Parry, Jd; Roberts, Ec; imek, K (2008-09-18). "Selective feeding behaviour of key free-living protists: avenues for continued study". Aquatic Microbial Ecology. 53: 83–98. doi:10.3354/ame01229. ISSN 0948-3055. ↑ Stibor H, Sommer U (April 2003). "Mixotrophy of a photosynthetic flagellate viewed from an optimal foraging perspective". Protist. 154 (1): 91–8. doi:10.1078/143446103764928512. PMID 12812372.